Self-adhered felt and cork diameters are used for anti-scratch protection and 3D spacer applications for point of purchase. Manufactured with a pressure sensitive adhesive for convenient application on any display project. Cork and Felt pads are available as dots, hexagons, squares, strips or custom shapes provided to fit your spec. Supplied in rolls, cut-to-width pieces and pads or die-cut dots, hexagons and other custom shapes. 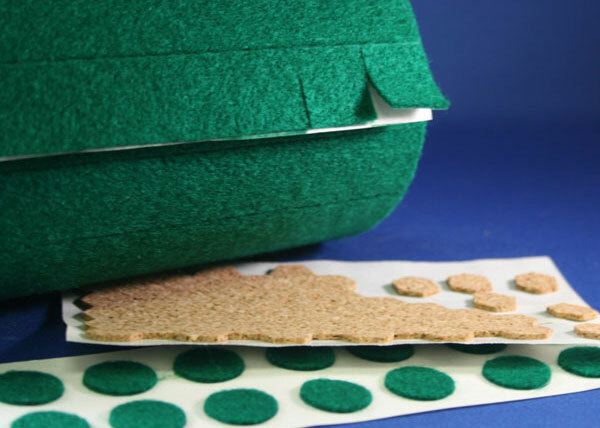 Natural cork or felt products are available with pressure sensitive rubber-based permanent adhesive or acrylic. Felt is available in green, grey, black or tan. All natural cork is also available with a special rubber blend upon request.